Rebel cheese rollers defied the weather yesterday for the chance to chase an 8lb piece of the dairy product down a steep hill. 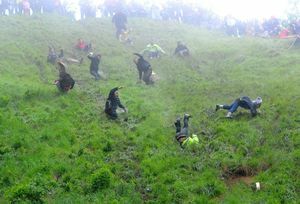 They staged their own unofficial event after the world-famous Cheese Rolling was cancelled for a second year running. The race had been advertised on social networking sites, with a page set up on Facebook and people posting messages on Twitter. There was a large police presence at entrances to Cooper’s Hill, at Brockworth, near Gloucester, but the event went ahead. Several hundred spectators braved the fog and rain to watch about a dozen daredevil athletes pursue the Double Gloucester cheese 200 metres down the 1 in 2 gradient. Competitors slip, somersault and tumble their way to the bottom in spectacular fashion during the bone-crunching races – and the first person to grab the cheese wins. This year champion local cheese roller Chris Anderson, 23, won the three adult male races while Jo Guest, 14, from Wolverhampton, came out on top in the women’s race. The unusual event has been celebrated for centuries and is thought to have its roots in a heathen festival to celebrate the return of spring. The last time cheese rolling was staged, in 2009, more than 15,000 people turned up. But a plan this year to move the racing to June and make it a two-day festival were scrapped when it was revealed that people would be charged £20 to attend.